Sit back, relax and enjoy our Herbed Sirloin Roast Vegetables. 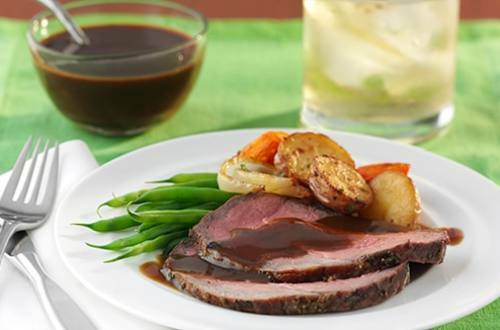 Tender, juicy sirloin and sweet gravy make this beef recipe restaurant-quality. 1 Preheat oven to 425°. Mix 1 tablespoon oil with 1 crumbled Knorr® Beef Bouillon Cube and half the herbs and garlic in small cup. Rub over roast; place in roasting pan. 2 Roast 20 minutes. Reduce oven temperature to 350° and roast an additional 1 hour or until meat reaches desired doneness. 3 Meanwhile, about 20 minutes before roast will be done, combine remaining oil, Bouillon Cube, herbs and garlic in large bowl. Add potatoes, carrots and onion and toss to coat. Arrange on baking sheet. Roast, turning vegetables once, 30 minutes or until tender. 4 When roast reaches desired doneness, remove from oven and let rest 15 minutes. Meanwhile, prepare Knorr® Classic Brown gravy mix according to package directions, adding pan drippings. Serve with roast and vegetables.